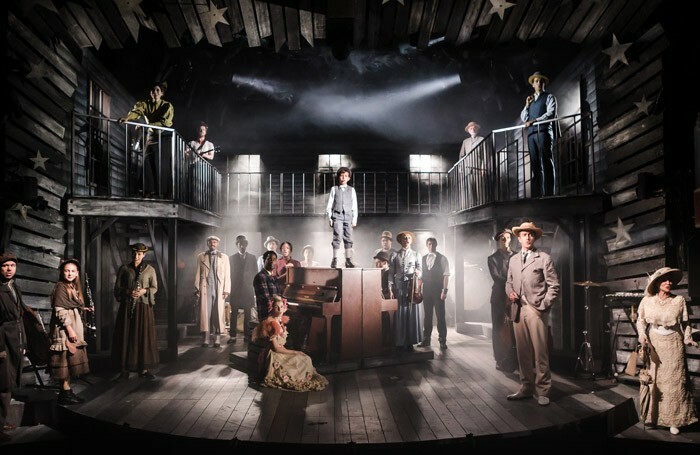 Director Thom Southerland is fast becoming a one-man industry for reviving and reinventing neglected and/or problematic Broadway musicals with a sweeping magnificence – he makes them soar anew. After recent triumphs with Titanic and Allegro, he now delivers a knockout production of Ragtime, the original production of which was pipped to the 1998 Tony Award for Best Musical by The Lion King, but deservedly won for its book and score. The show may lack Disney’s populist touch and there are times when it is as earnest as it is heartfelt, but it has far more dramatic momentum in its poignant portrait of the overlapping lives of three families – one WASP, one Jewish, one black – at turn of the 20th century in America. In the age of Trump, it’s a bold reminder of how hard the battles for integration have been fought and how immigration has enhanced the nation. Southerland’s genius is to turn the staging into a collective effort, with a large company of actor-musicians (there are 24 in all) flooding the Charing Cross stage and spilling regularly into the stalls, always maintaining rapt attention to the show’s musical intricacies, from the concentrated cello playing of Joanna Hickman (who also provides a ravishing turn as vaudeville actress Evelyn Nesbit) to the double piano that also serves as a staging platform. With superb ensemble support throughout, there are stand-out leading performances from Anita Louise Combe, Earl Carpenter and Jonathan Stewart as the WASP family, Ako Mitchell as the wronged black man Coalhouse Walker who turns activist after his partner Sarah (Jennifer Saayeng) is killed, and Gary Tushaw as immigrant-turned-film director Tateh.